Quick (Fast) Size is an oil-base gilding adhesive. It has an approximately 1 - 2 hour set time, and about 1-2 hours where leaf can be applied. 2. 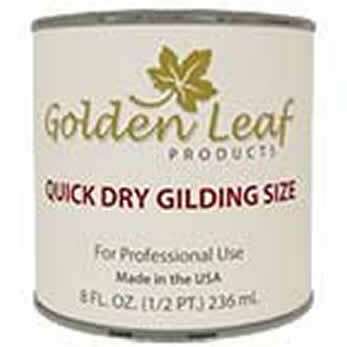 Quick Dry Gilding Size can be applied with a brush, roller or by spraying. After about 1 to 2 hours, the size will be set. The set time will vary depending on the temperature and humidity. A good test to see if the leaf can be laid is to run a clean dry finger across the surface of the size. If it squeaks, you can apply the leaf. If it feels tacky or wet, it is not ready. 3. Once the size has set, you will have approximately 1 to 2 hours to apply the leaves depending on the temperature, humidity and thickness of the application. 4. If a slower set time is needed, Slow Set Size and Quick Dry Size can be mixed in a 1:1 ratio resulting in a tack time of about 3 hours, allowing approximately 3 hours to apply the leaf.